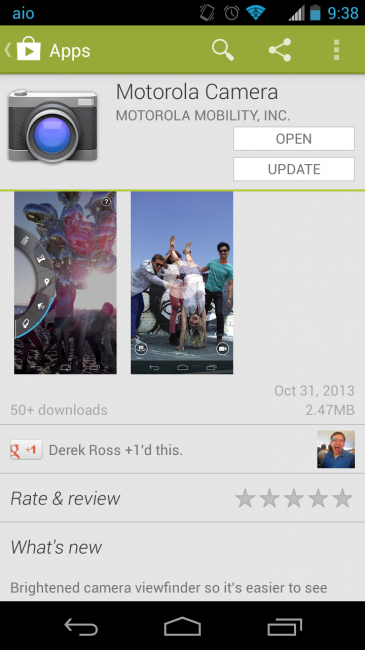 This morning, Motorola pushed an update to the Moto X camera through Google Play. Yes, through Google Play, not as an OTA update. As has been well documented, the Moto X camera at launch was one of the phone’s weak points, however, a recent OTA update to all variants dramatically improved its performance. Since then, it appears as if Motorola has made the camera available for updates more regularly without carrier interference. To continually update the app, Motorola is pushing updates through Google Play going forward. If you own a Moto X, you should find an update awaiting you. We haven’t had a chance to test the camera after the update since it just went live, but we’re excited to see Motorola taking updates this serious. Google took this route with a number of Google apps over the last year, a move that gives them more control over updates and features. We like it.